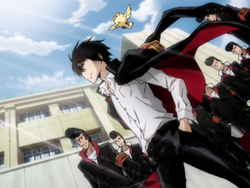 Namimori Discipline Committee: guardians of justice in Namimori.They are a group of criminals,howerer they are saying opposite.Their leader is Hibari Kyoya.He is the strongest member,but other members are strong as well.This group is based on KHR anime/manga..
2.Full obeyance to your leader. 3.Discipline.You must know the rules and respect them.Moreover you are a helpers of real moderators,so you should report all the cases. We are the group of people who keep this forum unshaken. Whoever joins will not let me down. please translate to english, im not good at russian even though i know it a little bit.